I’ve never been part of an AFL grand final week but I’ve been told it’s a thing to behold. The whole city of Melbourne hits fever pitch and becomes absorbed with the culmination of Australia’s most popular winter sport. The best illustration of the AFL’s position atop of the Australian winter sporting landscape (perceived or actual) was on show after a West Coast Eagles training session had more than 15,000 people in attendance. Out of AFL land came the quote “It’s bigger than a Sydney NRL crowd”. The sad fact of the matter is that the statement was pretty close to the mark and league pundits had no reasonable response. Once again AFL had kicked the NRL down the ladder to an almost conceivable irrelevance. In fact, the whole narrative of the finals series was how the AFL crowds dwarfed the NRL. But if you fast forward approximately two and a half weeks from the grand final weekend – a different story unfolds. Across the Tasman Sea, the Australian Kangaroos suited up against Tonga in front of a packed out Auckland crowd. 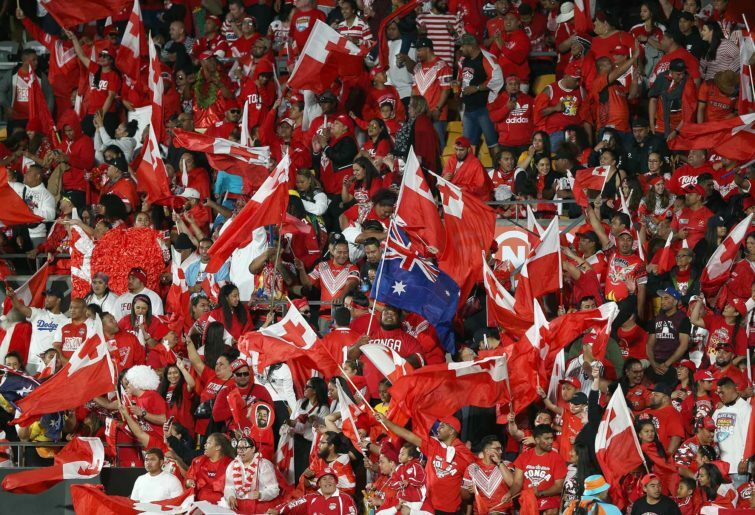 Those who attended or watched from home witnessed sea of red shirted fans singing passionate hymns as the Tongan boys mixed it with the world’s best (something that was inconceivable ten years ago). Although Tonga fell short the game was considered an enthralling contest and a success as far as crowd numbers and viewing figures were concerned. The next month England played New Zealand in front of approximately 25,000 people at the famous Anfield stadium (home of Liverpool FC). In the same three game series they packed out the smaller stadiums in Hull and Leeds, both heartlands of rugby league. During this time there was all but silence outside of AFL’s heartlands with the competition finished up for the year. Whilst rugby league has a long way to go as far as international development compared to rugby union, it is light years ahead of the AFL. The AFL is desperate for any international content – so much so that every year it moves a fixture to China to play in front of around 13,000 fans and manufactures a series against Ireland with a hybrid game of gaelic football and AFL. They have even developed an Australian Football International Cup which I had never heard about until I started writing this article. It is a televised event that occurs every three years in Australia and consists of amateur international teams. It is hard to find crowd numbers and viewing figures but the fact that 18 men’s and eight women’s teams compete shows AFL has some international footprint. But when comparing the NRL and AFL, fans and commentators only look to Australia – they fail to take in 70,000 fans at Old Trafford every year for the Super League grand final, the Wembley stands crammed with screaming Frenchmen at the Challenge Cup Final in August of last year and the rows of fans ten deep at Port Moresby airport wanting to get a glimpse of NRL heroes or the Meteoric rise of the Toronto Wolfpack, the world’s first transatlantic professional sports team. When comparing the two codes in their respective heartlands of Sydney and Melbourne respectively you can see that comparisons are so lopsided that the NRL risks becoming irrelevant. However if you look at it globally the results tell a far different story – rugby league can hold its own. In February of this year both competitions pre seasons will be well underway and the AFL will persist with yet another hybrid game born in 2017 called AFLX. This is played on rectangular pitches and has a two pronged desire of growing the game internationally and also moving in on the rugby codes territory. Meanwhile, NRL champions the Sydney Roosters will fly over to Wigan to play against the Wigan Warriors for the World Club Challenge in front of a packed DW stadium in one of the true rugby league cities of the UK. The AFL’s amazing PR machine will make sure no comparisons are made while the NRL’s fractured relationship with its media will probably eventuate in little reporting on this world championship fixture, yet to the keen observer it will be another interesting comparison to see how the two codes really compare.